I think I’m getting my reading mojo back! I branched way out of my comfort zone last week with two genres I don’t normally read: psychological thrillers and sci-fi. Both were page turners and set me up nicely to return to something more in my comfort zone. I guess it pays to shake things up sometimes! Also, my husband and I took a night away from the kids last weekend, which is always much appreciated and provided some good reading time in the hotel spa’s relaxation room. I’ve been somewhat burned out by the psychological thriller genre and this book reminded me why. And – #WTFthatending is definitely a love it or hate it kind of thing. I’ll be sharing all my thoughts in an upcoming Spoiler Discussion post. This was a library hold that unexpectedly came in…which is proving to be a good way to force myself to read the 2016 Books I Missed (this is the 4th book I’ve read from that list so far). Man, was this a page turner. It was completely out of my usual wheelhouse (I guess it’s technically sci-fi, but in the same accessible way The Martian is) and I had no idea what was going on for awhile, but not one bone in my body wanted to stop turning the pages. I’m about 25% through this one and had lowered my expectations after reading some underwhelming Amazon reviews. But, I immediately loved the writing style and tone. I think this one will work for me…despite those haters on Amazon. This debut novel about two South Korean women navigating their country’s economic revolution has been recommended for readers of Anthony Marra (author of The Tsar of Love and Techno ). One Year Ago: I was trying desperately to get out of a reading slump. Two Years Ago: I was reading some just-OK books, but was about to pick up a massive winner! Tags: It's Monday! What Are You Reading? I finished Frank Shorter’s autobiography–review to come on Friday. And Jodi Picoult’s book reappeared in my library feed, so I’m going to try to finish it up. Glad you get another shot at the Picoult! I’m going to add Dark Matter to my list. And I am really looking forward to your thoughts on Behind Her Eyes! Yay for spoilery posts. Really no other way to write about that one, right?! I recently read Dark Matter, too – I was a little unsure going in because I’m not a big sci-fi reader, but I could not stop reading it! It was so great. Totally agree! A perfect sci-fi for people that don’t normally like sci-fi. B/c it was really about the people and big life questions. The sci-fi just enabled it. A Separation….I’m over halfway in and still not loving it. It’s true that I’m also not crazy about the narrator, but am trying to keep that separate from the actual story. We’ll see, but so far I’m underwhelmed! I’ve had absolutely no interest in Dark Matter, but now you’ve made me curious! I love the “I was reading” that you’ve added to the end. What a great idea! Are you going to give us titles next time? And – click on the links of the “I was reading” section for titles 🙂 Should I change the link text for next time? Put titles instead? Dah! I didn’t notice that they were links. Maybe underline them next time? I like that you didn’t actually say what the titles are. It makes the reader want to take a look. I guessed what that upcoming “massive” winner was! Good idea and good guess! DARK MATTER was a lot of fun. I’ll be surprised if someone doesn’t pick it up for a movie or TV event. Haha – def a record! I think Behind Her Eyes is a hard one to comment on without revealing much. And – I read somewhere that the film rights to Dark Matter have been purchased…maybe for over $1M? Wow. Behind Her Eyes and Dark Matter in the same week. Great week! Dark Matter was a lot of fun. I’m in the middle of Behind Her Eyes. It’s very hard to put down. I’ll be so interested to see what you think of the Behind Her Eyes ending! I’d kind of dismissed Dark Matter but you’ve made me think I need to consider it. I dismissed it for awhile too…but one blogger whose taste I generally agree with loved it. That tipped the scales for me. It’s a good sci-fi for people that don’t normally like sci-fi. Glad you are getting out of your reading slump, I love psychological thrillers but don’t really red sci-fi. After a blogging slump in January, I rocked the reading and read 6 books.now that I’m back to blogging, I am struggling to finish 1 book in February. Clearly I need to do better balancing! Haha – it’s so hard to balance it all! But glad you’re getting out of your reading slump. I’m SO glad you enjoyed Dark Matter; I know too many people who dismissed it last year. For me, it was one of my favorite reads of 2016! I was one of those – but I’m glad I finally came around! Sometimes backlist is just what you need! I’ve been reading more backlist than usual this year so far – I think putting backlists on hold at the library has been forcing me to make time for them when they come in. And so glad you got a night away – it’s so necessary every now and then! I’ve been on the fence about Dark Matter fearing that it wouldn’t be enough Science Fiction for me. I read a lot of that genre. Come see my week here. Happy reading! Well, it was definitely non-sci-if enough to appeal to me, so you could be onto something. But, as a person that doesn’t generally love sci-if, I’m probably not the best person to ask. Great list. I really enjoyed Dark Matter but I am a SFF reader in general. I try to force myself to read other things so that I don’t pigeonhole myself into just SFF 24/7. I liked that Dark Matter was a good read for anyone. You don’t have to be a scifi junkie to enjoy that one. It was a cool concept! It was definitely a good read for everyone – probably why it appealed to me…haha! And – I do think you’d like Dark Matter! Give it a shot when you need something you can just fly through! 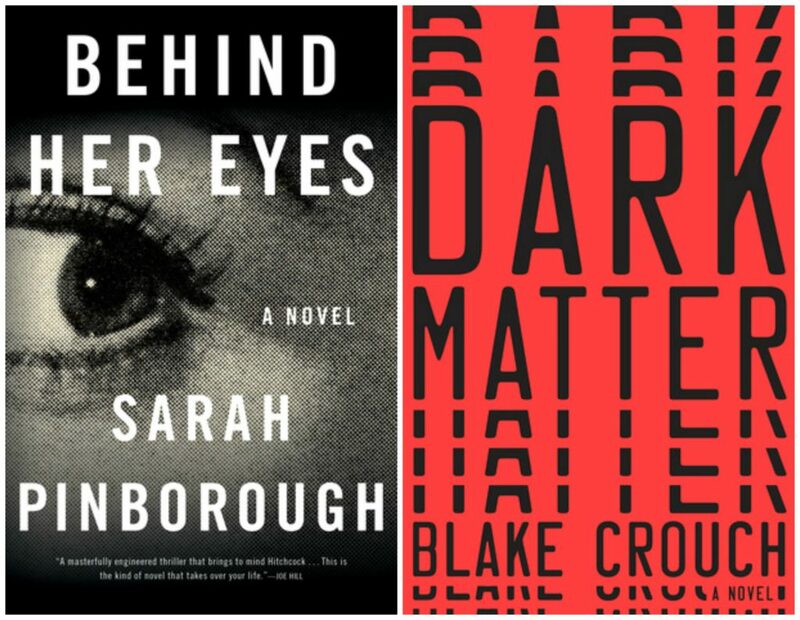 I have been eyeing Dark Matter…and I was enjoying Behind Her Eyes…until that ending. What a disappointment! I need to visit that spoiler post you’re going to write. I had to take a break from thrillers for the rest of last week…but now I’m reading another. However, it’s different. (My Husband’s Wife). I will lower my expectations, and maybe it will work. I’m 100% with you on that ending! I’m reading Everything Belongs to Us right now. I’m liking it (some characters more than others), but I wish they hadn’t compared it to Anthony Marra. Invoking his name made me expect something extra–and some humor. Glad to know that about Everything…will definitely lower my expectations which is a good thing. I was recently on vacation and saw someone reading Every Thing Belongs to Us. By the time I got back to where they were once sitting, they were gone so I couldn’t ask if they were enjoying it. Dark Matter has been on my list for a long time. How do you think it would be in an audio version? Dang it! And that would’ve been fun to see why he/she was reading it since it’s not out yet! I normally don’t like fiction on audio, but DM was so action packed that I think it would be one of the only types of fiction that could work for me on audio. It reads a little like a movie script. I ordered Dark Matter after reading a great review and that was before it made the TOB Long list. And now that it didn’t make the short list, I’ll have to read it “later”. But I will! I’ve been thinking of picking up Behind Her Eyes, but I’m also kind of a wimp when it comes to creepy stories. I need to gauge if it is more suspenseful or if it’s going to keep me up at night! It’s definitely more suspenseful than creepy. Not “scary” at all. 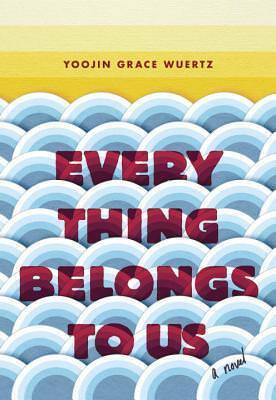 I’m currently reading Everything Belongs to Us. It’s a tad slow in places (for me), but not bad. I am wait listed for the audio of Dark Matters, it should be coming up in the next couple weeks. Have a great week! I’m hearing some not so great rumblings about Everything…ugh. I’ll go in with lower expectations. Oh I’m glad you enjoyed Dark Matter. I so know what you mean about not being able to stop turning pages. That was one of the craziest reading experiences I had last year. Definitely not my usual genre but glad I gave it a shot! It was insane! And am also SO glad I gave it a shot. I saw dark Matter at BEA but did not take a copy. Gah! Now I wish I would have. Adding it to my library holds because who doesn’t need can’t-put-down reading?! I just finished Lincoln in the Bardo. LOVED it. I’ve been thinking about it for you. I know it may not be your normal thing but Saunders is so inventive, which I know you appreciate. Maybe the audiobook? I heard it has a massive cast of celebrities, which makes sense because there are over 100 voices in the book. I think I’m going to let you vet Everything. It sounds like something I’d love but hearing mixed feelings about it. It’s bananas…definitely a good choice when you’re looking for something you can just fly through. I’ve been hesitant about Bardo. I heard Saunders is really into magical realism, which is a no go for me and then someone else mentioned Bardo was a bit tedious. Also not what I’m looking for right now. Ooh, I can’t wait to hear about the ending of the Pinborough book. I always get excited and nosy when people say they want to talk about a controversial ending. READING THE END IS THE BEST WAY TO BE. Haha – love your last line! What a great reading week! I so wish I could start over, and read Dark Matter for the first time again! Oh well, I still have Behind Her Eyes to look forward too. I just picked up a copy over the weekend!! Hope you have another great week! I mean – it’s a quick read if you want to be able to be in the conversation or are curious what’s behind that hashtag. I don’t regret reading it, but it’s possible it was more of a hate-read for me. Page turners are great for pulling you out of a reading slump – glad you enjoyed those titles! I have my eye on Dark Matter. I hope you enjoy your upcoming reads, and have a great week! Totally agree! They’re one of my go-to slump busters. Hope you get to Dark Matter! Oh, gosh. I had plans to read Dark Matter back in September and never did. *palm slaps self* I’d forgotten about it. I need to push it back up on my list. I FINALLY got my copy of Behind Her Eyes in the mail, so I hope to start it this coming weekend or early next week. I’m not sure on the setting for Everything Belongs to Us. I like the synopsis, but the setting has me in reservation about it. I hope it’s a good one for you, though. Finish Behind Her Eyes soon so we can discuss – I’ve now posted that spoiler discussion I mentioned! I ended up bailing on Everything Belongs to Us 🙁 Just couldn’t get into it…kept zoning out. Zoning out…that’s kind of how I was with The Animators. I hope to start Behind Her Eyes Monday. Totally LOLed at #WTFthatending! If I hear even a whiff of that about a book, I am OUT! I keep seeing DARK MATTER pop up everywhere and I neeeeds it! I absolutely should have crawled into your brain before I read this one! Although I can’t say I regret reading it…sometimes hate-reading is more fun than meh-reading. I do think you should try Dark Matter..when you need a page turner you can just fly through without a ton of thought.